In this Photoshop Effects tutorial, we're going to look at an easy way to adjust the depth of field in a photo, keeping only a small portion of the image in focus while taking the rest of it out of focus. This is a great way to bring attention to a specific part of an image (someone's face, for example), and the effect is similar to how things would look if we had shot the photo with a wide aperture. For best results, we'll be using Photoshop's Lens Blur filter to create this effect, which is available in Photoshop CS and later, which means you'll need at least Photoshop CS to follow along with this tutorial. 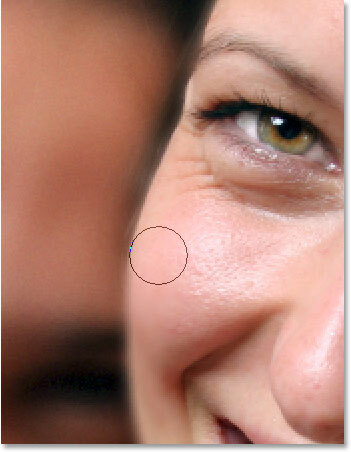 If you're using Photoshop 7 or earlier, you can still achieve good results with Photoshop's classic Gaussian Blur filter, but the Lens Blur filter is the filter of choice for this effect because it tries to mimic how an actual camera lens works, whereas the Gaussian Blur filter simply blurs everything out. The Layers palette showing the copy of the Background layer above the original. 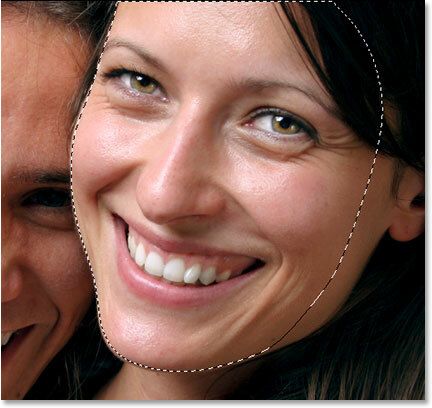 The area around the woman's face is now selected. Clicking on the "Quick Mask" icon below the Foreground and Background color swatches in the Tools palette. In "Quick Mask" mode, the area outside of the selection appears overlaid in red while the selection outlines disappear. Notice how my selection looks pretty bad, but that's okay because we'll be softening it next. Increase the "Radius" value in the Gaussian Blur dialog box to create a smooth transition along the selection edges in Quick Mask mode. The selection edges have now been softened. Clicking on the "Standard Mode" icon in the Tools palette to exit out of Quick Mask mode. The standard selection outline is now visible once again while the red overlay disappears. Go to Select > Save Selection. Click OK to exit out of the Save Selection dialog box. The saved selection becomes a new "Alpha channel" in Photoshop's Channels palette. This is important because in a moment, we're going to be using this black and white alpha channel we've created as a depth map for the Lens Blur filter. A depth map is simply a grayscale (black and white) image that Photoshop uses with the Lens Blur filter to decide which parts of the image to blur out and by how much. Any areas in the depth map that are pure black remain 100% in focus while areas that are pure white are completely blurred out. Areas that fall between pure black and pure white, such as the transition area around the selection edges, will be blurred to a lesser degree depending on how light or dark they are. If you were paying attention there, you may be thinking "Wait a minute, isn't that exactly the opposite of what we want? You said black areas remain in focus while white areas are blurred out, but in the alpha channel we just created, it's the white area that we want to keep in focus, not the black area. The black area is where we want to apply the blurring!" You're absolutely correct. We'll need to tell Photoshop to invert our depth map in the Lens Blur filter's dialog box, and we'll see how to do that in a moment. Switch back over to your Layers palette to continue. Go to Filter > Blur > Lens Blur. This brings up the Lens Blur dialog box, which consists of a large preview area on the left and a bunch of potentially confusing options along the right. You can safely ignore every option except for two of them - the Depth Map option that we just talked about a moment ago and the Radius option. For the Depth Map, make sure that Alpha 1 is selected so Photoshop uses the selection we made to determine how to blur the image. Of course, as we just pointed out, we need to tell Photoshop to invert our depth map so that the area we selected is the area that remains in focus. In my case, this means the woman's face will remain in focus while everything else becomes blurred. To do that, simply click inside the checkbox to the left of the word Invert. In the Lens Blur dialog box, make sure that "Alpha 1" is selected for the Depth Map and the "Invert" option is checked, then adjust the "Radius" slider until you reach the desired amount of blurring. After applying the Lens Blur filter, only the woman's face remains in focus. Fine-tune the amount of blurring by adjusting the opacity of "Layer 1". The image after fine-tuning the Lens Blur effect. At this point, the only thing I don't like is that there's some blur being applied to the left side of the woman's face (her right, our left) and it's causing her face to blend in with the man's face behind her. I'd like to touch that up so that her face appears nice and sharp along the edge. I can do that easily using a layer mask, and I'll do that next! Clicking on the "Layer Mask" icon. A layer mask thumbnail now appears on "Layer 1". Selecting the Brush Tool from the Tools palette. The Foreground and Background color swatches in the Tools palette. Painting along the edge of the woman's face to remove any unwanted blurring. If you make a mistake and accidentally paint over the wrong area, simply press X on your keyboard to switch your Foreground color to white and paint over the mistake, then press X again to switch back to black and continue painting away the blur effect. The layer mask thumbnail showing the areas that have been painted with black. And there we have it! That's how to easily create a shallow depth of field effect with Photoshop! Check out our Photo Effects section for more Photoshop effects tutorials!